Heat 1 tablespoon ghee in a heavy bottomed pan and add thin vermicelli. Roast it until golden brown. Stir continuously to roast all strands evenly and transfer it to plate. In the same pan, heat another 1 tablespoon ghee and roast cashew nuts and almonds until light brown, transfer them to plate. Boil milk in anther pan or same pan over medium flame. When milk comes to boil, add roasted vermicelli and cook over medium heat until it turns soft or for around 5-7 minutes. Keep stirring continuously while cooking and make sure not to overcook it. Add sugar, raisins and cardamom powder and stir to dissolve sugar. Cook for 2-3 minutes and turn off the flame. 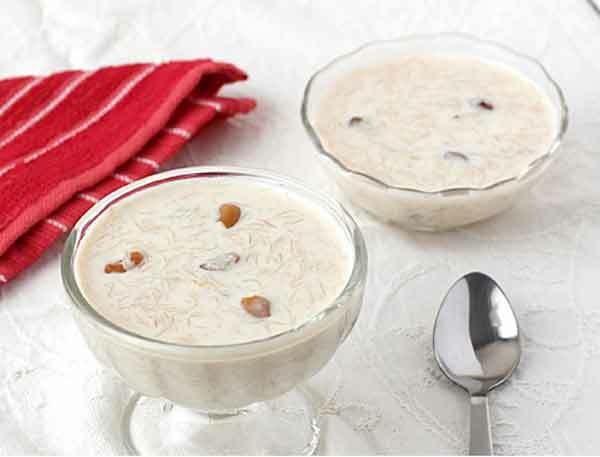 Transfer vermicelli kheer to a large serving bowl and place it in a refrigerator for 1 or 2 hours to chill. If it turns too thick after chilling then add milk to get your desired consistency. Garnish with roasted almonds and cashew nuts and serve. Serving Ideas: Serve it as a sweet dish in lunch or dinner or as a dessert after meal, according to Foodviva.com.